The following is the first entry of a two-part guest blog series from Born Free USA Program and Executive Assistant, Megan Knauss. Be sure to check back soon for part two! I've just returned to Washington, DC after an inspiring and enlightening trip to the Born Free USA Primate Sanctuary. Since I joined the Born Free team in 2013, I'd been reading about the sanctuary residents' stories, and I've secretly hoped that I would have the opportunity to experience the sanctuary for myself. Fortunately, my wish came true! After spending just four days at the sanctuary - located in a remote part of southern Texas - it feels strange to wake up to the sounds of the city instead of the calls of monkeys. I even felt a sense of sadness as I looked at the monkeys one last time and stepped into the van for the airport. Clearly, I hadn't anticipated the effect that this trip would have on me. My assignment was to collect photos, videos, and interviews, but I brought back so much more than that. For example, if I'd never gone to the sanctuary, I would never have fully appreciated the people who work there. I was thankful for their hospitality and their willingness to accommodate the needs of my project, but what touched me the most was their dedication and hard work for the nonhuman residents of the sanctuary. The staff members begin their day before 7:00 a.m. and they work into the late afternoon, cleaning the enclosures and changing out water, preparing food and medications, creating and distributing enrichment - objects or activities that the monkeys can interact with for mental stimulation and general entertainment - and performing checks to ensure that everyone has been fed and is in good health. Even though the work is demanding, the staff gives 110 percent in every aspect of their job. Seeing them in action was a powerful reminder that humans can be involved in monkeys' lives in ways that are not harmful but rather beneficial and positive. Then, of course, there are the monkeys. On the ride down from the airport, Sanctuary Director Tim Ajax explained the history of the sanctuary and answered my many questions about the monkeys who live there. He told me about some of the differences in background and behavior between the former pets and the monkeys retired from laboratories. I learned that, in the primate "pet" trade, the babies are stolen from their mothers almost immediately after birth. They're never able to form that crucial bond in the formative years, and they grow up not with the proper guidance of a familial troop, but under the ownership of humans, inept and ill-equipped to provide for their "pet's" needs. Primates used in research, on the other hand, are now often left with their mothers for the first six months of their lives and seem to be better adjusted as compared to those kept as pets. Researchers found that separating the mothers and babies at birth led to undesirable behavioral outcomes. 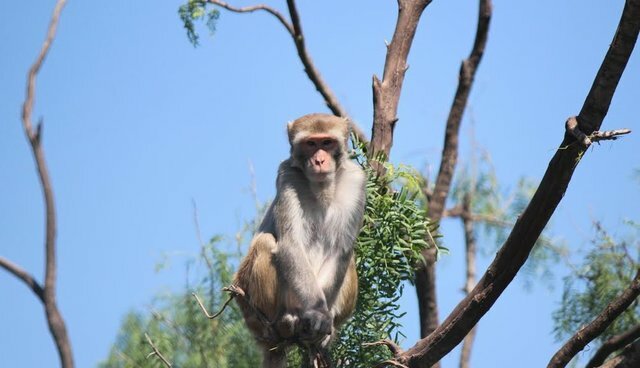 Many of these monkeys spent years in laboratory research and since it is general practice for laboratories not to disclose information about their research, the staff can only guess at what these individuals have gone through and how best to help them. After receiving this information, I prepared myself to be surrounded by a lot of disgruntled, angry, and damaged monkeys. These expectations were only somewhat accurate. Let me explain. Several of the monkeys at our sanctuary, including former pet India, still engage in the self-directed behaviors, such as spinning or biting their arm, they relied on to cope with stress in their former lives. Some of the sanctuary residents endured experiences that took a toll on their health. For example, a few of the monkeys have diabetes and/or are overweight, either as a result of previously inappropriate diets or because of their utilization in obesity studies. One sanctuary resident, Theo, suffered from chronic eye problems, but the staff wasn't sure what the cause was ... until he was taken to a specialist and they discovered a loop of wire left over from a research project embedded in his eye. Also, certain individuals exhibit behaviors left over from their days as "pets." Tamae, for example, often presents her backside to the staff for grooming, and if her request is not immediately met, she becomes visibly frustrated. Alice, kept as a "pet" for years, has to be treated with more caution than most of the other monkeys due to her hostility toward humans - which is quite understandable, considering what she was forced to endure in her former life. I would be lying if I said that witnessing the repercussions of forcing wild animals into an unnatural life in captivity did not make me angry. I'm excited to share more of my experience with you in my next blog entry! Part two of Megan Knauss' guest blog - describing more of the beauty she saw - will be posted soon!